The Bugaboo Comfort Wheeled Board with Seat is designed for older toddlers and preschoolers. 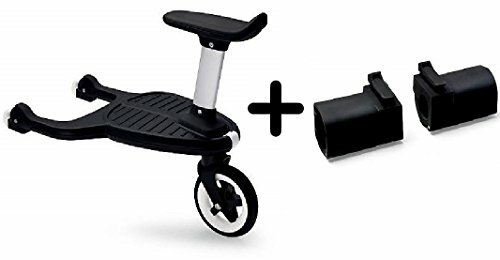 The Bugaboo Comfort Wheeled Board Adapter for the Cameleon is for the Bugaboo Cameleon strollers only is included; different adapters are available for the Bugaboo Bee, Donkey, and Buffalo strollers. The Wheeled Board can hold children up to 50 pounds. Adapters are also designed to attach on either side as well as the middle, so you can buy yourself a little bit of strolling space by moving your adapter three inches in either direction.